The silence of night has a way of helping us remember just about everything we had hoped to forget. The nights of stress and worry for parents can accumulate over time like blown leaves against the outside corner of a house. All of a sudden, without warning, circumstances arise and night will get even darker. It seems almost unfathomable that in those moments we could forget to remember the Name above all names. But we do. Not purposefully, not disrespectfully, not for lack of love or worship, but because the accumulation of life’s stresses and worries is overwhelming. Then it comes to us — just a whisper at first, maybe because we are praying for our child, but it comes. Jesus — His name is a penetrating ray of hope. We remember it. We lift our head. Our hope reappears! When morning comes, we are thankful again that He is the light of our night. Try to remember the One who always remembers you. Why does the darkness of worry and stress frighten you? Why does His name help you? 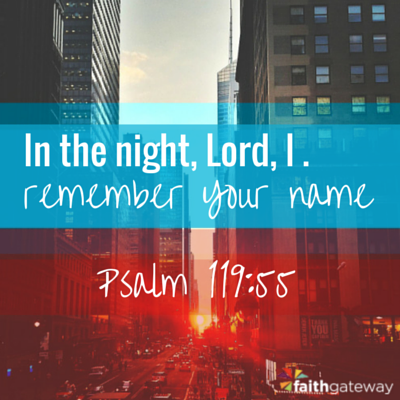 What could you do to remember His name more often? Let’s be real, life is stressful. We often need to refocus and gain some perspective in the midst of overwhelming situations — to remember the One who is our hope. Jesus is the Name above all names who is always good and always with us. Excerpted with permission from Once-a-Day Nurturing Great Kids Devotional by Dan Seaborn, copyright Zondervan 2014.